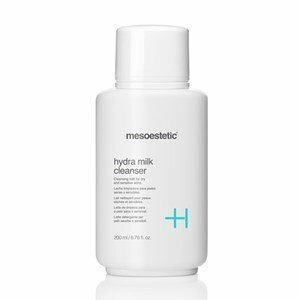 Hydra Milk Cleanser is a gentle cleansing milk, suitable for all skin types. Allows the an effective cleaning of the surface of the skin, while respecting the physiological balance. Totally eliminates makeup and small impurities of the epidermis. Cleansing and toning the skin are two absolutely necessary basic gestures for skin health. They are also vital to the success of moisturizing, anti-wrinkle, anti-dark spot and matifying treatments, etc., applied on the skin. Only a perfectly cleansed skin, can breathe well and fully absorb the active components of the treatment creams. Apply on face with the help of a cotton pad with smooth movements. Repeat the application until the cotton comes out clean. Composition: essential oil of manzanilla, glycerin.